I seen a bull moose with only one antler this morning. Is he considered a legal immature bull? The one antler only had 5 points which is not legal in BC but with nothing on the other side does that make him legal? 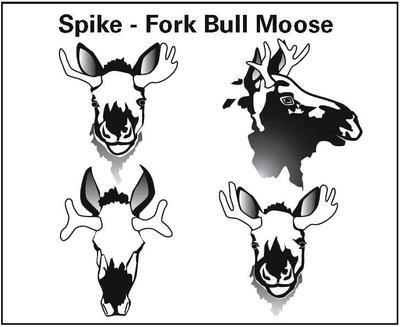 First off you have to realize the BC Government has done away with the immature bull moose terminology going in favor of the spike/fork regulation. This is to reduce confusion in identification and understanding of the various moose hunting seasons. Antlered Animal - means a member of the deer family over one year of age bearing visible bony antlers. Buck or Bull - with reference to deer, moose, or elk means one bearing visible bony antlers. Buck or Bull - with reference to caribou, means a male one year of age or older, bearing visible bony antlers. Going by the definitions you have answered your own question. With an antler only on one side and the visible bony antler having five points, means you may NOT harvest under the spike/fork regulation. Another topic I may bring up, would be ethics. Under the spike/fork regulation, lets just say your bull had a remaining main beam of his antler, say 1 1/2" in diameter and 10" long on one side and 5 points on the other. Would this antler configuration satisfy the regulation? I would say so. But, what is the point of the regulation? It is written that hunters will only harvest immature bull moose (spike/fork configuration). Legally, this hypothetical moose would satisfy the letter of the law. Ethically? Well, that is a question only you can answer.